We all use the past for our own purposes. Some of these are quite innocent, some are not. I’m sure we can all thing of examples for both cases. As you might expect, it has gone on since the invention of writing. Skirmishes became major victories, minor rulers become emperors, and so on and so forth. I’m watching V For Vendetta as I write this, in which a man in a dystopian future uses ideas about the past to inform the present and future. Although there are no Guy Fawkes or revolutionary figures on show here. Some medieval writers were very clear about why they were using the past. 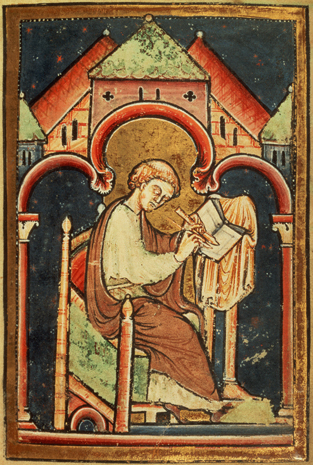 Bede, the subject of my PhD, wrote that “should history tell of good men and their estate, the thoughtful listener is spurred on to imitate the good; should it record the evil ends of wicked men, no less effectually the devout and earnest listener or reader is kindled to eschew what is harmful or perverse”. Bede’s interpretation is always religious, and for him, learning from “good men and their estate” would inspire people to live good, Christian lives. But by establishing this in the preface, he establishes the precise meaning that he wants the audience to derive from the work. It’s only one facet of the text, but it’s a very important one. Bede, of course, was not an innovator in this. The Classical world had paideia, and education by good example was an important part of this; consider the qualities extolled in The Odyssey or The Aeneid (although neither are actual histories, they were intended and were understood to be such). People’s use of the past is often determined by what they need for the present. In Bede’s case, it was to encourage moral and religious reform amid what he believed to be a deep spiritual crisis. By using examples from Anglo-Saxon and continental history, his Ecclesiastical History became a “gallery of good examples”, to quote the oft-repeated phrase of James Campbell. I, like most people working in the field, would hesitate to say that Bede invented aspects of an individual’s character, and he probably did not. However, that is not to say that Bede did not emphasise certain elements in order to inspire the most reform. There are enough facets of King Edwin’s character, for example, that work against him being an ideal Christian ruler when Bede could simply have written them out and made him the Constantine-style ruler that King Oswald is in the EH. Edwin, for example, promises to convert several times but always finds an excuse not to become Christian. Oswald is Christian from the beginning of his reign. 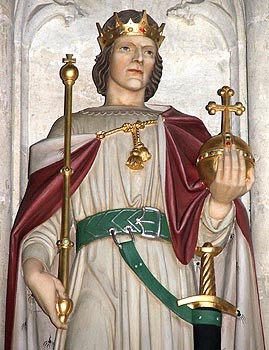 Oswald, for example, becomes more than just a great king in Northumbrian history, he becomes a Northumbrian Constantine who restores and renews Christianity in the kingdom and, in Bede’s account, makes sure the religion becomes so embedded in the realm that it does not flitter away, as it had when Edwin was killed. I wrote a whole MA thesis on this, so I won’t repeat it here. But suffice it to say that Bede thus presents a progression in his people’s history, where they become more solidly Christian and so greater culturally and politically. By implication, these good examples become symbols of what they can achieve and what they stand to lose should they stray too far from the path, as he believes they are. Bede sought to use the past to make the present and future better. Gildas, the British writer of the sixth-century, wrote history for the very same reason, although he was also writing against the backdrop of Saxon invasions and the threat of imminent conquest, which he understood to be divine judgement. He, in turn, used the Bible as a model for his history: prophetic history. Gildas, by identifying current events with ancient patterns, stitched his people into universal history and, in doing so, sought to expose corruption and “sting” the present so that society could be healed. The Bible was, for Gildas, a “mirror” for his own times. It was a key for medieval writers to unlock not only the past but their own times. By studious analysis of the narratives and themes, they saw patterns in history that they believed were being replicated in their own days. Bede too looked into the Bible and saw it as a reflection of the present. When commenting on the destruction of the temple in Jerusalem and the exile to Bablyon (in the book of Kings), he says that the “allegory of so lamentable a history fits so well with the negligence of our own time”, but with Jerusalem standing for the Church and Bablyon for “the city of the devil”. Much of what I’m doing is recreating this sort of early-medieval mindset, because by studying the historian I can more effectively study the history. The study of the Bible and commentary on the texts, exegesis, informed a good deal of medieval history writing. Bede’s Ecclesiastical History is, as Benedicta Ward noted, as much theology as it is history. I’m not much of a theologian, but I have always been a decent literary critic and analyst, so those skills are very much coming to bear on the structure and development of Bede’s writing. It is a very different intellectual world from the one we inhabit, and as such it becomes all the more of a puzzle. I suppose a fair question to ask at this point is, ‘How do I use history?’ I am no prophet or theologian. For me, history is a way to explore the past, both at a cultural and intellectual level. I can pick up a book and chip a way into a world now lost to us. It’s probably why I favour ancient and medieval history; the modern is just too familiar. While I have learned much from my study of history, I seek to learn and teach rather than mould wider society. I don’t have the specific drive of a Bede or a Gildas, or perhaps I do but with a different focus. Having scribbled thus I feel there is a lot more to be said on the subject. I will return to it now and again, methinks. But for now, I shall let history tell its own stories. This entry was posted in ancient, Anglo-Saxon, Bede, Christianity, History, Medieval by David O'Mahony. Bookmark the permalink.